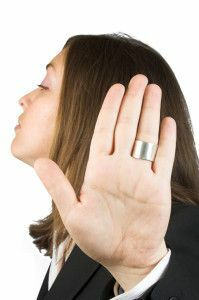 Recently a client expressed some frustration over a situation where a prospective customer scheduled a phone appointment and then didn’t answer at the scheduled time. My client left a voicemail and sent a follow-up email checking in about rescheduling the appointment. Days later she hadn’t heard anything back from the customer. Has this ever happened to you? You have a client who’s expressed interest in your product/service, and then they drop off the face of the earth, never to be heard from again. Do you assume they’re no longer interested? How many times do you follow up before you make the decision to move on? After digging a little deeper into the communication between my client and her prospective customer, it was apparent the interest level was high initially. She wasn’t sure why her prospective customer had lost interest and wasn’t sure what to do next. Should she continue calling and emailing or walk away from the opportunity? With that in mind, I outlined specific language for her to use on her next follow-up call to the prospective customer. After listening to the follow-up message, the prospective customer called right back to say she was dealing with a family tragedy and she was still interested in working together. One week later she became a paying customer. 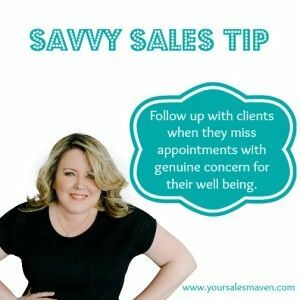 Your Savvy Sales Tip this week: Follow up with clients when they miss appointments with genuine concern for their well-being. Check in to make sure they are ok. If you received a voice mail like this, would you be inclined to return the call to put the person’s mind at ease? Especially if something did actually go wrong, wouldn’t it be nice to know someone noticed and was willing to check in with you? The most successful salespeople I know, care about their clients. The relationship should come first before the sale. Wishing you well this week. Hi, I check your new stuff like every week. Your story-telling style is witty, keep up the good work! such targeted about my trouble. You’re amazing! Thanks! Wow! Finally I got a web site from where I can in fact take useful data concerning my study and knowledge. The clarity in your submit is simply great and that i can think you’re an expert on this subject. Well along with your permission let me to seize your RSS feed to keep up to date with imminent post. writing regarding cultureand fully explained, keep it up all the time. like reading your posts. Keep up the good work! about your post on AOL? I need an expert on this area to resolve my problem.